Long before we opened our doors in 1995, Winona Foods was built on a cheese-making heritage. The managing partners at Winona Foods began their journey working at family-owned cheese companies, where they learned the art of cheese making and the pride of quality and customer service. 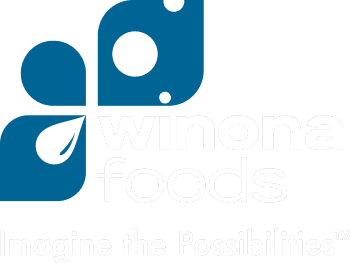 Since then, Winona Foods has expanded its focus in the areas of food-service, industrial ingredients, retail and co-packing industries. Our dedication to providing the highest quality portfolio of products, a dedicated customer service team and exceeding industry standards, makes Winona Foods a leading manufacturer in the industry. Winona Foods provides a variety of services for dairy manufacturers, industrial and food service customers. With manufacturing distribution centers strategically located throughout the U.S., we can develop, manufacture, package, store and deliver to the highest of standards. From development to delivery-Winona Foods will partner with you every step of the way. Our Mission: Winona Foods is committed to being the industry leader by providing our customers exceptional solutions, service, quality and value. In 2004, Winona Foods created a state-of-the-art manufacturing facility, which was featured on The History Channel's "Modern Marvels." Our industry-leading facility allows our highly skilled R&D team and culinary experts to develop custom recipes or formulate national brands to meet your exact specifications. Our expanding portfolio of products and innovative packaging includes cheese and cheese products, sauces, salsa and more. Natural Cheese. Process Cheese Products. Cheese Sauces. Cheese Spreads. Red Sauces. Portion Controlled Options - Cups/Pouches/Bags/Bottles. In January 2018, Winona Foods began full operation at our new facility in Howard, WI. This facility includes a commercial kitchen/product performance center, technology and equipment to offer customers performance oriented products and support of our current manufacturing facilities. The commercial kitchen gives Winona Foods the opportunity to test our performance oriented products for the end user. The Howard facility will offer customers a better understanding of Winona Foods and their ability to service customers and work with them to increase the market segments they are targeting together. Natural Cheese, Specialty Cheese, Imitation Cheese, Vegan Cheese, Italian Cheese, Performance Cheese. Cheese Shreds. Cheese Slices. Cheese Cubes. Cheese Dicing. Cheese Chunking. Commercial Kitchen and Product Performance Center.